I’m getting the opportunity to get lots of training at work at the moment, and that usually comes with book recommendations. The Inner Game of Work is about coaching, and written by W. Timothy Gallway who revolutionised tennis coaching by focussing on inner resistance rather than technique. The idea is that performance is as much about what’s going on in your head as it is about skill and ability. Negative self-talk can drag down the best players. 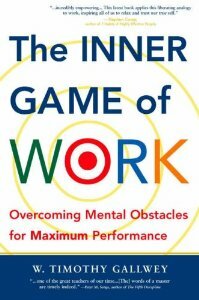 The Inner Game of Work talks about learning, focus, finding your joy, and awareness. Which is great, but it’s long on theory and short on practice. It asserts the importance of being present and being in the moment but offers little guidance as to how you do that. You’ll have to turn to other books for that. It was pretty hard work reading it but there’s some useful ideas. I did like the section on thinking like a CEO. It challenges you to question whether you are actually in charge of the corporation that is you or whether you’ve given decision-making responsibility to others. These are ‘stakeholders’ such as family, employers, friends, and anyone else who has an opinion about how you live your life. I like to think of it as being master of your own ship because I was a pirate in a past life, but the CEO metaphor works as well. I am on the lookout for a writing coach in the London area though, so if you can recommend someone, let me know in the comments.